These creatures were believed to have perished after a massive event killed off 90 percent of species on Earth. A North Carolina paleontologist, while visiting a small Russian museum, has accidentally discovered two new species, which roamed the Earth before dinosaurs but he was surprised to see that their roles changed over a period of time. 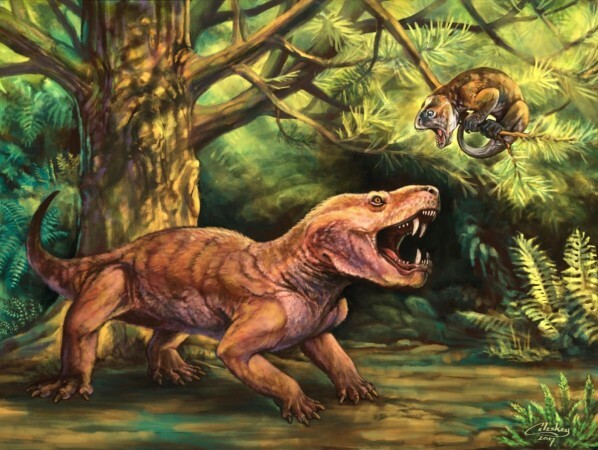 These two species are Gorynychus and Nochnitsa, which are protomammals, mammal-like reptiles that existed millions of years before. The new species are named after legendary monsters from Russian folklore. Gorynychus is named after Zmey Gorynych, a three-headed dragon, and Nochnitsa is named after a malevolent nocturnal spirit. Based on their relatively large eye sockets, it is likely that Nochnitsa and its relatives were nocturnal, scientists said. In the Vyatka Paleontological Museum in Kirov, Russia, almost an entire skull of the saber-toothed Gorynychus remained unidentified for decades. Christian Kammerer, research curator of paleontology at N.C. Museum of Natural Sciences, said, according to thestate.com, "I would guarantee you there are thousands of undescribed species in museum collection. Most new species are found in museum collections for the sole reason that there are literally millions of species on Earth today and many more in the fossil record. When you're going out and collecting specimens, you won't know those things. The people in the museum knew they were protomammals but they didn't know they were new species," Kammerer said. Protomammals lived during the Permian period, which ended around 252 million years ago. These creatures were believed to have perished after a massive event killed off 90 percent of species on Earth. Gorynychus were more in numbers than Nochnitsa and remained top predators. However, the sizes of these animals stunned Kammerer. While Gorynychus were smaller and ate insects, Nochnitsa were tiger-sized saber-toothed carnivores. It is like, the palaeontologist says, bears and weasels traded sizes. "In the age before the dinosaurs, when protomammals were the dominant life on land, you had two different groups that switch off on which is the top predator. You have wolf- to lion-sized saber tooth animals wiped out by a mass extinction, and [the Nochnitsa-like animals] take over. But [Gorynychus-like animals] aren't wiped out altogether in this extinction, and they take over and become a small insect eating predator, not large carnivores anymore." Also, Kammerer says that mid-Permian fossils are hard to find as erosion, earthquakes, and volcanoes have destroyed the most Permian rock. Researchers are not sure what happened to these protomammals. Though they have inferred that top predator position swapped in South Africa, they are not able to determine if it happened globally or was a local development. "Until we have finds from multiple continents, it's very hard to say what's a global pattern and a mass extinction instead of a regional extinction. This is really strong support that this was going on worldwide, not a fluke in the South African record," Kammerer said. Essentially, Gorynychus and Nochnitsa provide the understanding of intervening ecosystem after the mid-Permian extinction (260 mya) and the more devastating end-Permian mass extinction (252 mya, which nearly wiped out protomammals). In late Permian ecosystems, the top predators were giant (tiger-sized), saber-toothed gorgonopsians and therocephalians were small insectivores but by mid-Permian ecosystems, these roles are reversed. "In between these extinctions, there was a complete flip-flop in what roles these carnivores were playing in their ecosystems -- as if bears suddenly became weasel-sized and weasels became bear-sized in their place," said Kammerer.